A triple stabbing, a mother's plea over road developments, and a £1.5m sports hub are among the stories hitting the headlines in the weekly newspapers. 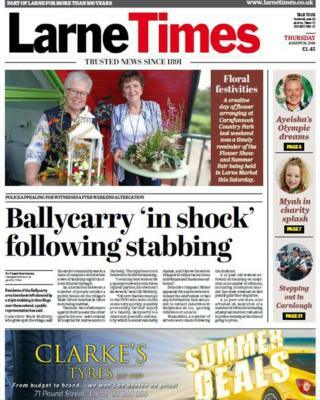 The triple stabbing was in Ballycarry, County Antrim, and makes the front page of the Larne Times. Two men in their 30s and a man in his 60s were treated in hospital after the incident outside a bar in Main Street last Saturday morning. Their injuries are not believed to be life-threatening. A 31-year-old American electrical engineer who was on honeymoon has since appeared in court on three attempted murder charges. Nicholas Warner, from Summerville in South Carolina, accepts having a knife and causing the injuries, but will argue he acted in self-defence, his solicitor told Limavady Magistrates' Court. A 27-year-old woman who was arrested, has been released on bail pending further enquiries. The newspaper also has an interview with Ireland hockey goalkeeper Ayeisha McFerran, who was recently guest of honour at a special mayoral reception in Larne. Ayeisha claimed the goalkeeper of the tournament award at the Women's World Cup in London, where Ireland finished runners-up. The 22-year-old said she is now setting her sights on qualification for the 2020 Olympics and paid tribute to her late mother Sandra for fostering her love of sport. "When I was growing up, I was one of those kids who had lots of energy so she always encouraged me to try new things," she said. "She was always driving me to things like swimming, football or gymnastics; I did about nine or 10 years of Irish dancing as well." 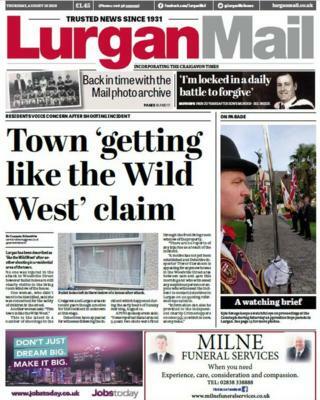 The Lurgan Mail reports that the County Armagh town has been described as "like the Wild West" after a shooting in a residential area. Two shots were fired through the living room window of a house in Woodville Street last Sunday morning. Elsewhere, the newspaper has an interview with Bridie McGoldrick, whose son Michael was shot dead by the Loyalist Volunteer Force at the height of the Drumcree stand-off in July 1996. Mr McGoldrick, a Catholic who had recently graduated from Queen's University, had been working as a taxi driver. His body was found in his cab in a country lane at Aghagallon, several miles from Lurgan, a day after he had picked up a fare in the town. Mrs McGoldrick says it is a "daily struggle to forgive" and she continues to ask God "for grace to keep that forgiveness in my heart". 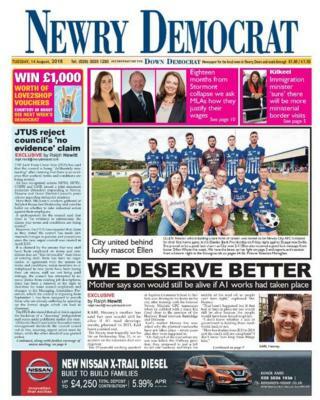 On the front page of the Newry Democrat, the mother of a crash victim claims her son would be alive if A1 road developments planned in 2011 had been carried out. Karl Heaney, 27, died on 23 May on the dual carriageway. He was driving home when his vehicle was in collision with a car close to the junction of the Halfway Road between Banbridge and Dromore. His mother Monica has asked why planned roadworks at "the Halfway junction" have not taken place seven years after "they were supposed to". "On that part of the road where my son was killed, the Halfway junction, they proposed to put a left in/left out roadway and block the middle of the road off so people can't turn right," she said. A spokesperson for the Department for Infrastructure said it was developing proposals to further improve road safety on the A1. The department said that while plans for the A1 junctions phase two road improvements scheme had not been finalised, it was "currently proposed" that the Halfway Road northern junction was one of nine side roads selected for full closure. It added that the Halfway Road southern junction "is currently proposed to be retained but reconfigured to operate as a left-in/left-out arrangement only with no facility for right turn manoeuvres across the central reserve". The newspaper also reports that the Minister for Immigration Caroline Nokes has said she is "sure" there will be more ministerial visits to Newry before the Brexit deadline. She spoke to the Newry Democrat on board the fishing vessel Unity at Kilkeel harbour last week and emphasised that the government does not want physical infrastructure along the Irish border. Sinn Féin's South Down MP Chris Hazzard criticised Ms Nokes for not meeting him during her visit. The Home Office said Ms Nokes was on a "private visit" and had met representatives from the fishing industry. 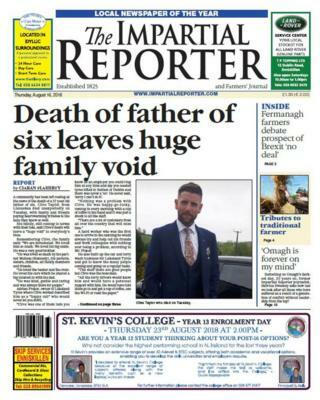 The sudden death of a father-of-six from Lisnaskea in County Fermanagh makes the front page of the Impartial Reporter. The family of 37-year-old Clive Taylor said they were "devastated" and that his passing had left a "huge void". "He was kind, gentle and caring, and was always there for people," they added. Adrian Frazer, owner of Lakeland Tyres where Mr Taylor worked, said he was someone who would never let you down. 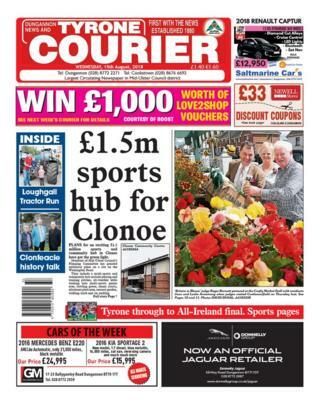 Elsewhere, the Tyrone Courier says that plans for a £1.5m sports and community hub in Clonoe have been given the green light by Mid-Ulster Council's planning committee. Proposals for the site on the Washingbay Road include playing and training pitches, a multi-sports games area, a bowling green, tennis courts, allotment plots, a sensory garden, a walking track and car parking. The newspaper says funding has yet to be formally secured but it is understood "a number of potential funding streams are being pursued". 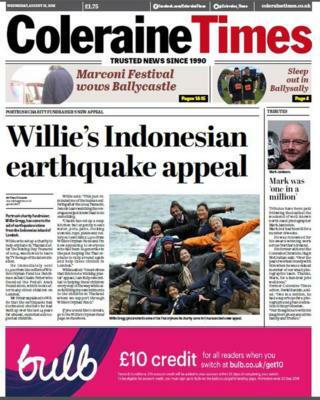 The Coleraine Times reports that Portrush charity fundraiser Willie Gregg has come to the aid of earthquake victims from the Indonesian island of Lombok. A 6.9 magnitude quake earlier this month is known to have killed nearly 100 people and left at least 20,000 people homeless. The newspaper reports that Mr Gregg, who set up a charity to help orphans in Thailand after the Boxing Day tsunami of 2004, "was moved to tears by TV footage of the latest disaster". It says he has sent £1,500 from his Orphan's Fund to the Peduli Anak Foundation, which looks after street children on Lombok. Tributes are also paid in the newspaper to photographer Mark Jamieson who has died after being ill for a number of weeks. Mr Jamieson, 60, won a number of awards during his career and the former editor of the Coleraine Times, David Rankin, described him as "one in a million". "He had a superb eye for a photograph and great dedication to his profession," he added.